Summary: Several factors could be contributing to China’s sudden entrance into coal import markets, including transportation bottlenecks, environmental and safety considerations, economic factors, and concerns about depleting coking coal reserves. Tu was a senior associate in Carnegie’s Energy and Climate Program, where he led the organization’s work on China’s energy and climate policies. Given the enormous size of China’s domestic coal reserves, why is China moving to import coal from abroad instead of producing all its needs domestically? Might this phenomenon be as superfluous and foolhardy as carrying coals to Newcastle, England’s major exporter of coal in the fifteenth century? Newcastle, after all, had more coal than anywhere else. Several factors could be contributing to China’s sudden entrance into coal import markets, including transportation bottlenecks, environmental and safety considerations, economic factors, and concerns about depleting coking coal reserves. Gaining a thorough understanding of the paradigm shift under way in the international coal trade requires exploring these factors in order to develop policies to best manage burgeoning coal imports in China and beyond. First, China will need to enhance its coal value chain—from coal mining to preparation, transport, and end use—to improve efficiency, reduce the environmental and carbon footprint of coal, and address safety in the face of China’s increased global coal utilization and trade. Second, it will be important to gain a better understanding of the relative costs and benefits of China’s emerging coal trade and the differences among Chinese mining companies and between Chinese and foreign mining operations regarding mining practices, regulatory oversight, and operations. Third, the parallels underpinning energy and climate concerns in the United States and China could serve as the impetus for bilateral cooperation on common coal conditions. Finally, oversight over growing global coal markets could be organized through new governance structures—international forums, regulations and standards, fiscal measures, and information—spearheaded by major coal export and import nations. China’s recent move from being a net coal exporter to a net coal importer portends significant changes on the global stage, especially in terms of climate change. Understanding China’s rising coal imports is crucial for managing their global impact. China is rich in coal, which accounts for 95 percent of the country’s fossil fuel endowments. According to the Chinese Ministry of Land and Resources, China’s proven coal reserves of 170 billion tons correspond to 19 percent of the global total, ranking second in the world after the United States (figure 1). Historically, China has been a net coal exporter. In 2003, China’s coal exports peaked at 94 Mt with coal imports at 11 Mt. Since China produced 1,835 Mt of coal and consumed a similar amount in the same year, imports had very little impact on China’s overall coal balance at the time. Just a few years later, in 2008, China’s coal situation would markedly change when China’s imports and exports equalized. In 2009, China imported 126 Mt of coal and became a net coal importer for the first time.7 While this paled in comparison to China’s total coal consumption of 2,985 Mt in 2009, it nevertheless accounted for 15 percent of the global coal trade. As the amount of China’s coal imports has drastically increased, so too has the number of its coal trade partners (figure 2). Currently, Indonesia and Australia are the two largest overseas coal suppliers to China. During China’s eleventh five-year plan period between 2006 and 2010, these two countries accounted for half of China’s total coal imports. But there is a difference in the mixture of products coming from each of the two suppliers. Indonesian exports to China are dominated by steam coal, which is suitable for producing steam and mainly used in power generation; it accounted for 95 percent of Indonesian shipments to China in 2010. In comparison, coking coal, which is primarily used for industrial processes like iron and steel production, represented 63 percent of total Australian coal exports to China in the same year. In 2010, both Canada and the United States exported around 5 Mt of coal to China, with coking coal accounting for about three-quarters of the total shipments. Chinese buyers have also begun to import a sizable amount of coal from South Africa and Colombia. And in the past few years, Mongolia has rapidly emerged as an important overland coal supplier for China, given its geographic proximity, large coking coal resource endowment, and relatively low mining costs. Once a largely isolated coal market, China now plays an increasingly important role in shaping global trade flows and increasing price fluctuations in world coal markets. Understanding the key forces driving Chinese coal imports is necessary for assessing the global implications of China’s international coal trade. There are several factors that could be influencing China’s coal-importing decisions. The majority of China’s coal resources are located in the western and northern inland provinces. The two provinces of Shanxi and Shaanxi and the autonomous region of Inner Mongolia alone account for nearly 70 percent of China’s proven coal reserves and more than half of national coal output.8 In contrast, many major coal-consuming centers are located along China’s heavily populated eastern and southern coastline, where less than 5 percent of China’s proven coal reserves are located but nearly 40 percent of national coal consumption was reported in 2010.9 This unbalanced coal resource distribution and consumption pattern means that coal must be transported long distances via railways, roads, or waterways (both inland river and coastal marine transport) from the west to the east and from the north to the south. Integrated railway and coastal marine shipping is the most important mode of coal transport in China. But China lacks dedicated southbound rail lines, which means that coal from the northern and western provinces destined for consumption in the south needs to be first moved eastward to seaports around the Bohai Bay in northeast China. From there it is shipped to major coal ports of discharge along China’s southeastern coastline. Due to the particular nature of the Chinese economy—the gradual shift from a planned economy to an increasingly market-oriented one, and a decade-long tight supply and demand balance of coal in the domestic market—it can be assumed that coal transportation infrastructure in China is usually operated at close to full capacity. This implies that the rapid growth of coal throughput in recent decades is primarily driven by the expansion of infrastructure capacity, rather than by an improvement in the efficiency and utilization rates of railways or seaports. Since 1980, national coal production in China has grown at an annual rate of 5.7 percent, reaching 3,235 Mt in 2010. During the same period, the growth in the total amount of coal transported by rail corresponded to an annual increase of 4.6 percent. In contrast, after a stagnation in the 1980s and early 1990s, coal throughput (both incoming and outgoing) handled by major Chinese coastal ports increased from 91 Mt in 1995 to 1,163 Mt in 2010, the equivalent of an annual growth rate of 19 percent.10 In other words, while the capacity expansion of seaports seems to have proceeded at a rate faster than national coal production, Chinese railways encountered great difficulty in keeping pace with the country’s burgeoning coal mining industry. Not surprisingly, measured as a percentage of national coal output, coal transported by rail has declined from 69 percent in 1980 to less than 50 percent in recent years. In comparison, coal throughput handled by major coastal ports has increased from nil in 1980 to 36 percent of national coal output (figure 3). 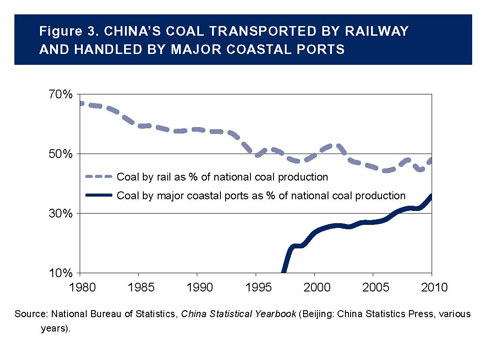 Thus, compared to the bottlenecked railway infrastructure, the increasingly less capacity congested coastal ports in China have been able to handle not only higher percentages of national coal output but also a sizable amount of coal imports in recent years. One of the reasons for the sharp contrast in capacity expansion lies in the organizational structure of railways and ports. Since China’s Ministry of Railways is both the regulator and the monopoly operator of China’s national railway network, a lack of competition has led to insufficient investment in coal rail lines thus far. China’s coastal port sector on the other hand was opened up to competition in the 1990s, which resulted in increased investment in port facilities and led to a seaport building boom. The capacity expansion of major coal ports of discharge in the southeastern provinces allows consumers there to choose between domestic coal from northern ports and overseas coal from the international market. Coal imported from overseas suppliers can help Chinese buyers ensure a stable supply of coal especially during the peak demand season. Chinese consumers along the southeastern coastline may therefore prefer coal imports for the purpose of supply stability. From the perspective of the Chinese government, rising coal imports might be encouraged as a way to ease China’s deteriorating transportation bottlenecks. Otherwise, costly investment would be required to build more dedicated coal rail lines and port facilities in northern China. The environment could also play a part in China’s coal-importing decisions. Importing coal from overseas markets might enable the Chinese central government to close down many small and inefficient mines and prevent similar mines from being opened up, thereby protecting local environments. Still, no matter where coal is mined, the process often has detrimental environmental effects on the host country. Evaluating this local impact against global environmental challenges and preventing a mere shifting of local environmental burdens from China to other coal-producing countries requires closer collaboration between China and its major coal trading partners. There is a vast amount of literature on local environmental degradation associated with coal mining activities. Local ecosystems and the health of residents adjacent to coal mines are particularly at risk. Acidic mine drainage and toxic coal sludge can contaminate local streams and groundwater. Mountaintop removal causes forest destruction, loss of wildlife habitats, and subsequent erosion, while underground mining can lead to land subsidence. Local air pollutants—nitrogen oxide and sulfur dioxide, and toxic heavy metals, such as lead, mercury, and arsenic—cause damage to human health. And coal dust, which is stirred up through coal mining, preparation, transport, storage, and end use, can cause severe respiratory problems. Moreover, both coal mining and processing are water intensive. Because many of China’s coal resources are located in arid regions, Chinese coal mining operations often compete with residents and agriculture for access to scarce water resources. As mining activities often draw heavily from groundwater sources, they have depleted groundwater levels in many coal districts. This has detrimental effects on local flora and fauna, especially during increasingly more frequent periods of drought. To the extent that coal imports relieve the push to keep small and inefficient mines operating or to site new large-scale mines, they could suppress widespread mining activities and the associated environmental damage to China’s coal-rich regions, such as Shanxi, Shaanxi, and Inner Mongolia. From a Chinese perspective, coal imports could serve local environmental goals, especially regarding small coal mines that have been difficult for the central government to regulate in an environmentally responsible fashion. On matters of air pollution and greenhouse gas emissions, impacts shift from the local to the global level. Air pollutants emitted in China, for example, can impact other continents, and greenhouse gas emissions from growing Chinese coal consumption are increasing concerns about global climate change. In 2006, China overtook the United States as the world’s leading carbon emitter. 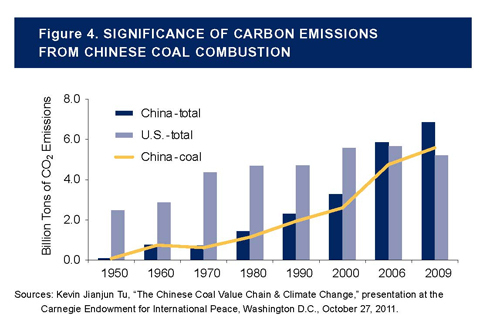 And since 2009, carbon dioxide emissions from Chinese coal combustion alone have exceeded national carbon emissions in the United States (figure 4). Pressures brought by emerging international climate treaties, such as China’s agreement to join a post-2020 legally binding climate regime by 2015 under the Durban Platform for Enhanced Action reached at the United Nations Framework Convention on Climate Change COP17 Climate Change Conference, exert tremendous pressure on China to reduce the carbon footprint of its coal value chain. China could view importing coal rather than mining it domestically as one possible strategy for reducing its coal-related carbon footprint. This, however, would merely shift the burden of coal production–related carbon emissions to other nations whose coal China imports, doing no good to stop rising global greenhouse gas emissions. In addition, this strategy would not directly address carbon emissions from coal combustion at Chinese factories and power plants. While the central government has repeatedly tried to shut down many of these mines, its efforts have been only partially successful. The government has faced a tight coal supply and demand balance—with China using so much coal, it would be difficult to lose the output provided by these mines—and vested interests in local governments try to keep the mines operating for the purposes of local revenue and personal gain. Insofar as they help ease supply and demand constraints, rising coal imports should make it easier for China to continuously close or consolidate small and unsafe mines. Thus the central government may view overseas coal imports as an alternative strategy to address the coal mine safety challenge in China. 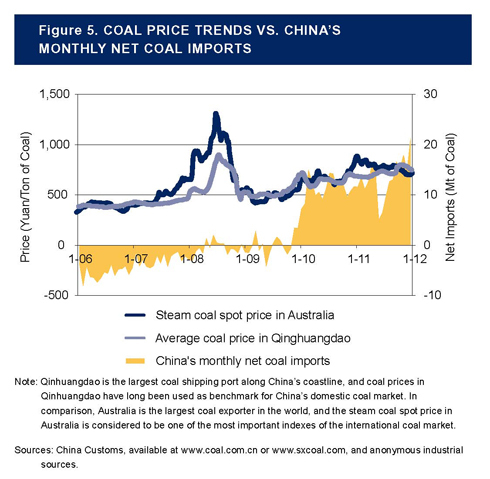 The issue of balancing China’s coal supply and demand given fluctuating international coal prices could have a strong effect on import levels. In addition, government policies that affect market forces may play a significant role in determining how much coal China imports. Historically, contract steam coal prices for utility use were tightly regulated in China. With contract coal prices set far below retail coal prices, Chinese utilities could buy cheap coal at the expense of coal miners. In 2006, China’s National Development and Reform Commission finally allowed prices of steam coal for utility use to be fully subject to the market. Since then, contract coal prices for utilities have increased rapidly. But retail electricity prices are tightly regulated by the central government to control inflation. Chinese utilities, as a result, have encountered great difficulties in their attempts to pass the increased costs of coal input to consumers and therefore look for ways to lower their generation costs. Under long-term procurement contracts, Chinese utilities can still buy large amounts of domestic steam coal at below-market prices. But as coal production in China constantly lags behind consumption spikes, coal miners often have little incentive to execute existing contracts to meet the demand of coal-fired power plants, preferring to sell more coal to the retail market and enjoy the subsequent windfall profits. These distortions can wreak havoc with domestic coal markets, tightening supply and demand to the point of serious coal and power shortages. Even after the onset of the worldwide financial and economic slowdown in 2008, the Chinese coal mining industry still pushed for higher prices for contract steam coal. Not surprisingly, China’s big utilities became increasingly frustrated with this. Meanwhile, for example, steam coal prices in Australia dropped substantially due to weak coal demand in the rest of the world. As overseas coal became cost competitive with domestic supply, utilities in China’s coastal provinces turned to the international market for a significant amount of coal imports (figure 5). 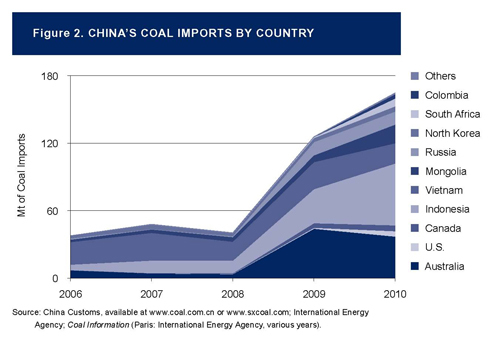 In 2009, China’s coal imports accounted for 15 percent of global coal trade volume. That trend could run in the other direction as well. Chinese buyers could significantly cut their coal imports if international coal prices become too high. In early 2011, for example, international coal prices were on average more than 10 percent higher than buying domestically, and Chinese coal imports plummeted, as illustrated in figure 5. Based on Chinese buyers’ behavior in the past, prices will likely be a significant factor for future coal imports. Squeezed by regulated electricity prices and looking to minimize costs, many Chinese buyers may import heavily when international prices are relatively low and rely on domestic coal when international prices are relatively high. Additionally, the Chinese government is considering capping national coal production at 3,800 Mt and national energy consumption at 4,100 Mt of coal equivalent by 2015.15 Given that China’s projected national coal consumption in 2015 ranges from 4,200 Mt to 4,600 Mt of coal, the disparity between government production quotas and national coal demand is expected to create pressure for increased coal imports. Iron ore and coking coal are two vital inputs for iron and steel manufacturing, and China had traditionally been a primary coking coal exporter. But China’s high-speed industrialization and rapid growth of iron and steel production capacity over the past decade is quickly depleting its coking coal reserves. To alleviate shortfalls in coking coal supplies, China became a net coking coal importer in 2004. In 2010, China produced 455 Mt of coking coal, equivalent to 51 percent of global coking coal production. Even so, China still imported 48 Mt of coking coal, 19 percent of the global total, in order to meet its burgeoning domestic demand. The sharp contrast between the share of Chinese coking coal reserves in the world and its output ratio in the international context indicates that China is depleting its reserves at very fast rate. Given the importance of coking coal in iron and steel production, the Chinese government is planning to categorize coking coal as a strategic resource, and could therefore explore increasing coking coal imports.17 Faced with specific coal resource constraints, the Chinese government might prefer importing coking coal to buttress supplies and protect domestic coking coal reserves from depletion. An additional factor that could drive Chinese coal imports upward is social unrest. For example, an unexpected outbreak of demonstrations in June 2011 was sparked by land seizures carried out by coal mining operations in Inner Mongolia.18 Though the Chinese government suppressed the incident, the growth in Inner Mongolia’s coal production—nearly 30 percent annually over the past decade—could be a contributing factor to higher coal imports to avoid future conflicts. While the list goes on, the discussions in this study nevertheless can serve as the basis for more in-depth exploration of the policy implications associated with China’s rising coal imports. Coal is expected to be China’s most dominant energy source in the foreseeable future. At issue is where China’s coal will come from—state-of-the-art domestic production, average Chinese mines with mediocre efficiency performance, small Chinese mines with terrible environmental and safety records, imports from other coal-producing countries with questionable mining practices, or imports from advanced coal mining economies with stringent environmental regulations. A few possible factors influencing China’s coal-importing decisions have been discussed here, but this is an ongoing conversation. Each of these supply options has its own set of trade-offs, and understanding them is beneficial to policymakers in all coal-producing and consuming countries. Far-reaching reforms of the governance structure of China’s energy sector are necessary, whether China shifts toward importing greater amounts of coal or not. Coal imports may serve a multitude of purposes, such as accommodating local environmental concerns, though a preferred strategy in that case is to enact regulations that improve the accountability and transparency of the Chinese coal mining industry. In addition, more efficiency throughout the coal value chain—from mining to transport and end use—could bring environmental, social, economic, and safety benefits nationally. It is imperative for the Chinese government to address coal-related policy challenges domestically. But the implications of China’s coal decisions are not just felt on a domestic scale. China’s rising coal imports already impact coal mining activities in many coal-producing countries, such as Mongolia, Indonesia, and Australia. Assuming that this trend continues, a comprehensive assessment of the associated global economic, environmental, and climate impacts will be necessary for the international community to manage forthcoming changes and prevent unintended consequences of emerging global coal trade patterns. Further discussion is key to addressing this international policy challenge. Discerning the differences among global varieties of coal, especially in terms of greenhouse gas emissions intensity, is also policy relevant. More broadly, gaining an appreciation for the common conditions that shape Chinese and American coal capacities could serve as a foundation for a long-term Sino-U.S. partnership to clean both countries’ coal value chains. Further, how to balance the national interests of individual countries, the economic benefits associated with China’s rising coal imports, and global environmental integrity is an open question that certainly deserves more in-depth policy elaboration. A comprehensive study that covers the entire Chinese coal value chain will be beneficial for not only the Chinese government but also the international community to gain a much more thorough understanding on the far-reaching policy implications of China’s rising coal imports. 1 National Bureau of Statistics, China Energy Statistical Yearbook (Beijing: China Statistics Press, 2012); Statistical Review of World Energy (London: British Petroleum, 2011). 2 National Bureau of Statistics, China Statistical Yearbook (Beijing: China Statistics Press, various years). 3 O. Tsukimori and C. Aizhu, “China overtakes Japan as world’s top coal importer,” Reuters, January 26, 2012, www.reuters.com/article/2012/01/26/coal-china-japan-idUSL4E8CQ3GS20120126. 4 R. Kebede and M Taylor, “China coal imports to double in 2015,” Reuters, May 30, 2011. 5 Statistical Review of World Energy. 6 Statistical Review of World Energy; National Bureau of Statistics, China Energy Statistical Yearbook, 2012. 7 National Bureau of Statistics, China Statistical Yearbook, 2011. 8 China Coal Industry Development Report (Beijing: China Coal Information Institute, various years). 9 National Bureau of Statistics, China Statistical Yearbook, 2011. 10 National Bureau of Statistics, China Statistical Yearbook, 2011. 11 Kevin Jianjun Tu, Industrial Organization of the Chinese Coal Industry, report prepared for the Program on Energy and Sustainable Development at Stanford University, 2011, http://iis-db.stanford.edu/pubs/23284/WP103_Tu_Chinese_Coal_Industry_26__July_2011.pdf. 12 See Shenhua Group’s corporate website, www.shenhuagroup.com.cn/zjsh/shgk/index.shtml (Chinese); National Administration of Coal Mine Safety in China, http://coal.nengyuan.net/2011/0117/73180.html (Chinese); and U.S. Mine Safety and Health Administration, “Coal Fatalities for 1900 Through 2010 ,” www.msha.gov/stats/centurystats/coalstats.asp. 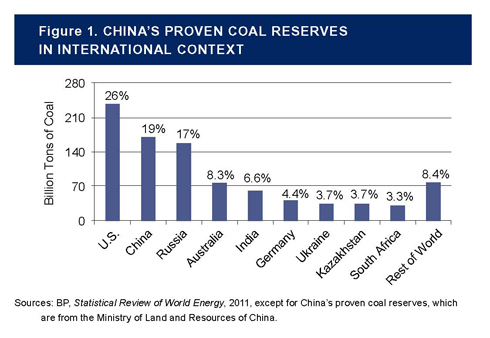 13 Kevin Jianjun Tu, “Coal Mining Safety: China’s Achilles’ Heel,” China Security, vol. 3(2), 2007, 36‒53. 14 China Coal Industry Development Report (Beijing: China Coal Information Institute, various years). 15 One ton of coal equivalent is equal to 1.4 tons of average Chinese coal. 16 See National Administration of Coal Mine Safety, www.sxcoal.com/business/1837/bookshow.html; and China Coal Industry Development Report (Beijing: China Coal Information Institute, various years). 17 International Mining, “China to “protect” strategic coking coal resources,” April 11, 2011, available at www.platts.com/RSSFeedDetailedNews/RSSFeed/Coal/8800458. 18 “Second death sentence after Inner Mongolia unrest,” BBC News Asia Pacific, June 21, 2011, www.bbc.co.uk/news/world-asia-pacific-13862219.